There's few albums in my library as singular as Treats. Unfortunately for Sleigh Bells, and for fans of Sleigh Bells, that applies to their discography too. Nothing since has sounded like it, and with each passing year, the duo of Alexis Krauss and Derek Miller pull further and further away from the ear-shattering shrill that made their debut a landmark for Indie's next phase. Their fanbase has lessened with each passing record too, which, given the begrudging shift towards ill-proportioned ElectroRock, isn't all that surprising. Last year I decided to fully step back into their world on Jessica Rabbit, as an update of sorts to their whereabouts in the music industry. I came out even more confused than my original ignorant state. The music didn't match Krauss' singing, her singing didn't match the music, the music didn't match itself. It was a blunderbuss that, had their past not played a role, I would've pegged as coming from an amateur group demonstrating their tasteless, almost edgy, genre combinations. It wasn't exactly Rock, nor Punk, nor Pop, nor Electronic, nor Indie. It was bits and pieces, shredded fragments, of each, stitched together by fidgeting fingers from a color blind artist. None of that truly changes with Kid Kruschev, a seven-track EP meant to quell their fading relevancy. But, I will skeptically say it's better than Jessica Rabbit, only for the fact that, for the most part, the scatterbrained ideas stay well contained within their respective songs. Kid Kruschev, as a whole, undeniably struggles to maintain any coherent theme, but on a song-by-song basis muted highlights do stand out. The first of which is the opener 'Blue Trash Mattress Fire,' a track that sonically centers on a rise and fall. The first 90 seconds is composed of silent meandering before leaping headfirst into a dirty barrage of noise, taking me straight back to the Treats era. And while Krauss' vocals are more prevalent here, her lyrics actually entice that debut's aesthetic ("I used to drink gasoline in the morning, and the middle of the day on the trampoline"). 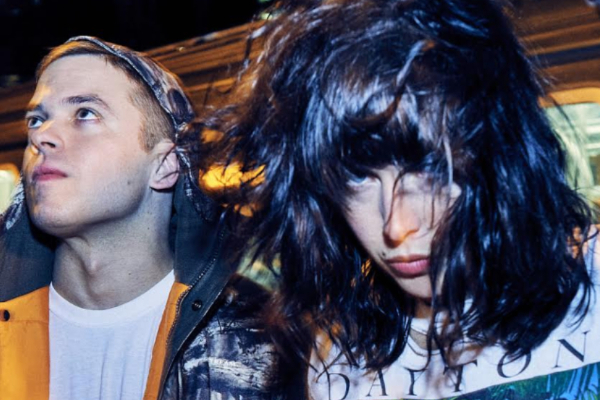 Unfortunately, the Treats nostalgia stops there, as the ensuing track 'Favorite Transgressions' finds Sleigh Bells sloppily clashing genres again. Tracks like this, and Kid Kruschev's two worst, 'Show Me The Door' and the unnecessarily sappy 'Florida Thunderstorm,' dart around without purpose or prose, reminding me of the lowbrow stylings of AWOLNATION, but without the sporadic catchiness to boast.